This is the first post in a series designed to act as an Introduction to Horror-Philosophy. Horror-Philosophy is the analysis, interrogation and exorcising of Horror and The Scary through the multiple lenses of philosophy. Horror-Philosophy is in the first stages of development and I hope to flesh it out through this series. Feed back is appreciated. Please comment below. In addition to this series acting as an introduction Horror-Philosophy I will be experimenting with and creating new terminology. I will define as I go. I will continue the series next month. The follow up post will cover: Why Horror?, The Scary and Ideology. The common sense understanding of Philosophy has relegated it to the flux of complex and floaty ideas that are of little use in individual's daily life. But, this take on philosophy is a bankrupt perspective rooted in anti-intellectualism. The more scared people are of learning and explain their capacity for critical thought they easier they are to control. The truth of the matter is that philosophy is a complex mufti-cultural tradition that has inspired everything from revolutions to toothbrush commercials. While these tree points are components of what philosophy has inspires; study and thought. What the definition fundamentally lacks is a description of what a philosopher produces. The philosopher produces thought which she carves into being by articulating a thought in a concept. In this sense, ideas are per-articulated concepts and the act of speaking and/or writing transforms the idea into a concept. Studies of Horror and The Scary are near absent from the philosophical tradition. Yet, The Scary and Horror is universal human experience. Horror takes two primary forms; fictional and Real. Fictional Horror has it's root in religious cautionary tales designed to regulate society and specifically children. Today, these cultural fears are infused into horror fiction; film, novels and so on. In this sense, Horror is intrinsically ideological, because horror stories are not just stories; they have an ideological function. Horror stories were intentionally discursive and designed to establish and regulate behavior. Real horror is trauma. Trauma is an individual or collective retrospective interpretation of an Event which destabilizes a personal or collective narrative. Trauma can be a un-designed and/or designed. For example, the terrorist attacks of 9/11 were an intentional act. The Event of Terrorism shook loose individual and collective narratives from their norms. The destabilization caused by an event Event produces The Scary. When a functional narrative is called into question by an Event nihilism is introduced which disintegrates personal and collective histories and destroys the cognitive space in which the future can be articulated. The Event never fully collapses a personal or collective narrative, but fragments meaning. The process of trauma fragments a narrative, much like a computer, by connecting disjointed meanings and incorporating new meanings to establish the stability of an individual or collective narrative. Horror-Philosophy is the analysis, interrogation and exorcism of Horror and The Scary. Horror and The Scary will be more fully discussed in a following post. Provisionally, I will define both terms. The scary is a the process of biological and cognitive which are the product of transference from a horror. Horror is a type of Event where The Scary, at it's simplest, is transference. Philosophy as defined above is the act where a philosopher creates concepts. Horror-Philosophy is the art of analyzing, interrogating and extricating Horror and The Scary. 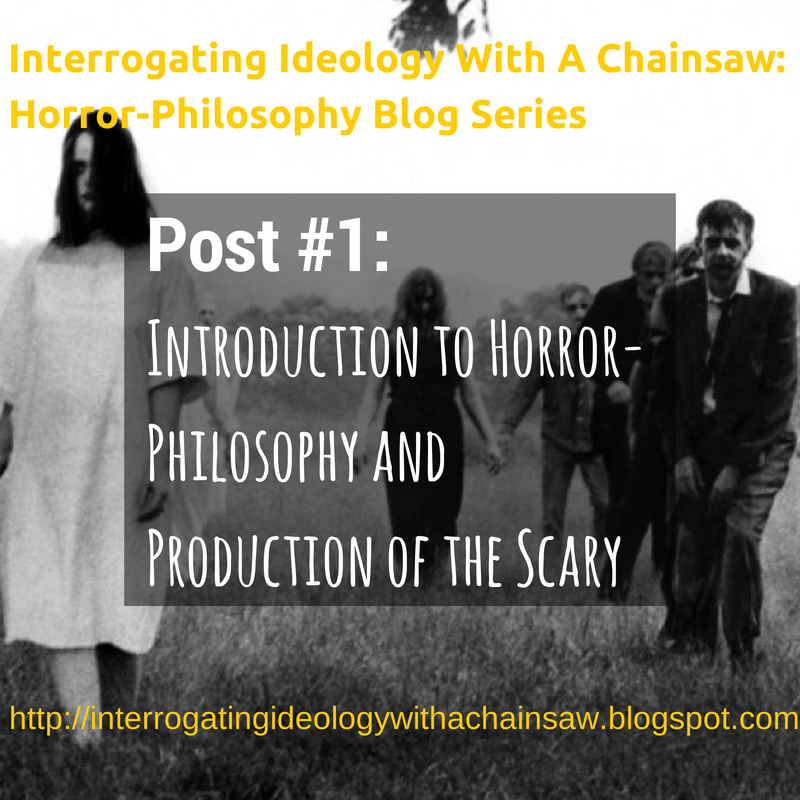 For the purposes of this series (and Interrogating Ideology With A Chainsaw) I will primarily focus on horror movies and may compare the fictional horror to Real horror. You might be asking yourself by this point, or before this point, what is it about horror that deserves this level of intellectual attention? Aren't horror movies frivolous and designed solely for escapism? Yes and No. Horror movies like films in general are created with a mind to the market and profit, but what distinguishes horror films, besides its blood and guts, is its ability to break the rules. I am not arguing here that all horror breaks the rules, but that as a genre breaking the rules is a key cultural function of horror. Unlike the scary stories that our hunting and gathering ancestors used to tell, contemporary horror while doing its part as cautionary tales, also disestablishes culture through its intentional use of Taboos. The greatest tension in the history of horror and in the films themselves is the dialectic between breaking the rules and maintaining the rules. In order to enter The Scary a viewer has to succumb to the sequence of scenes that create a norm. A woman slowly walks down a poorly lit corridor. The camera follows up and behind her showing the end of the corridor. The scene cuts between moments capturing the moment. juxtaposing the woman’s facial expression and trembling posture against the potential of The Scary springing forth from a window or open door or falling from the ceiling. The contradiction is not immediately apparent. How does the series of cuts form a scene and give life to a film's transference create and maintain a set of rules? The rule are maintained in the tension between contradictions. The viewer is expecting in one direction while dreading the reality and probability of The Scary. Around every corner something could jump and go BOO! The Boo! is receives its transference effect from the previous moment a priori to The Scary is a dread. The expectations are composed primarily within two features of a horror movie. The historical-collective-narrative-reality that a horror movie takes place in and the historical pattern that the cuts and scene reference. Most viewers of a horror movie are not watching a film in total isolation (unless it is their first time viewing a film, and even then there is an intertextual leakage between non-horror and horror). The scene of a woman walking down a dark corridor with dread is intrinsically intertextual. The scene is deployed in the context of a society which conditions the probability of the potentiality of a scene. Given the historical intertextuality of a scene, how does the scene nevertheless still produce The Scary? The scary is produce in the relationship between the viewer and the viewed. The actors emotions and mannerism protect a set of temperaments into the scene that has a transferential relationship with the viewer. In other words, the scene is coded with an emotional state and the viewer responds by reproducing a set of emotions in relation to the scene. The Scary is a product of transference. Google Books What is Philosophy? In-text: (Google Books, 2014) Bibliography: Google Books, (2014). What is Philosophy?. [online] Available at: http://books.google.com/books?id=gwVF7FpvsU8C&printsec=frontcover#v=onepage&q&f=false [Accessed 28 Jul. 2014].